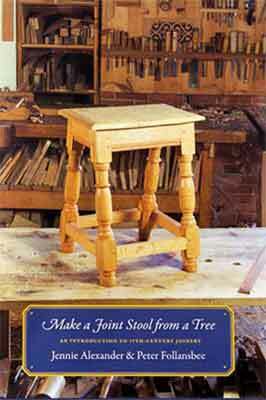 One method of decorating the rails of joint stools features mouldings cut either in the face of the rail - 'crease' mouldings in the period - or at the bottom edge of the rails. For either of these mouldings we prefer a 'scratch stock' to a moulding plane. 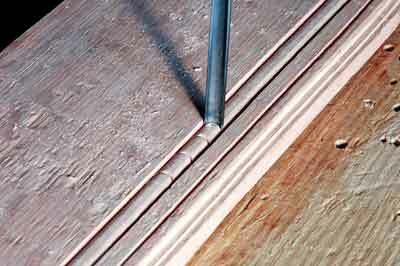 The scratch stock is a shop-made tool used to scrape the moulding's profile in the stock. Both methods were known and used in the 17th century. We don't know what period scratch stocks looked like, nor what they were called, but some period joined work has short runs of mouldings that fade in and out at the ends, something that usually cannot be done with a plane. We use two different configurations of scratch stocks, depending on whether the moulding is a crease moulding or an edge moulding. For the crease mouldings, make a scratch stock that works like a marking gauge: simply use a profiled cutter instead of a pin. 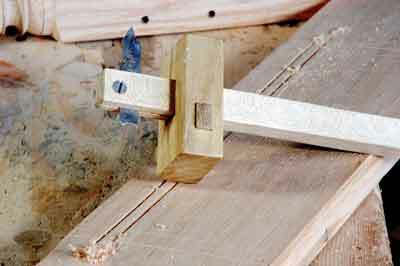 Secure the blade in a saw kerf in the beam. Close this kerf with a screw. Blades are made from saw steel - the thicker the better. Shaping the profile on the scratch stock calls for careful work. A saw-sharpening vice is a nice tool to secure the stock for filing. Use a large, flat file to remove the bulk of the material, just outside the desired shape. Then cut the final pattern with smaller files, both round and flat. The blade's edge is square to the sides. The moulding's profile is perpendicular to the surface of the blade and will scratch from both directions. See gallery image 4 for some suggested profiles. The scratch stock pictured here cuts a small bead. In this case, the bead is the first step in some carved decoration. 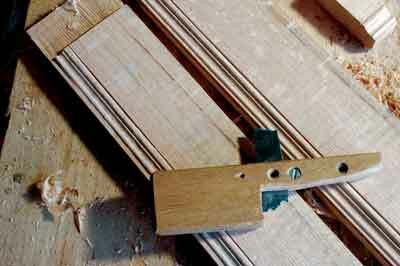 Hold the tool just as you would a marking or mortise gauge and lightly scrape the moulding. Repeated strokes will develop the shape cleanly. By now, the surface of the stock must have reached that point that we call 'workable moisture content' - dry enough to cut cleanly, and still green enough to cut easily. Next, use a small carving gouge to chop straight into the bead shape to begin defining a simple pattern. 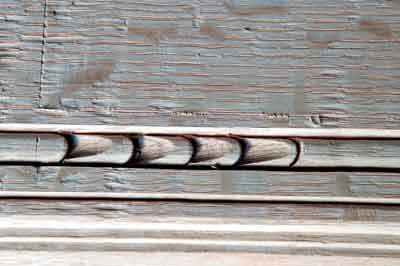 Ideally, the scratch stock is made to match the size of your carving gouge. 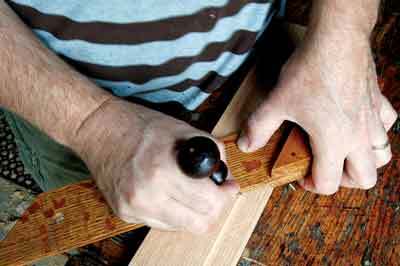 Hold the gouge perpendicular to the stock and strike it once with a mallet. Eyeball the spacing of these cuts. The next step is to angle the gouge behind the first cuts and chop out the chip. You will sometimes need to move the tool laterally at the end of the cut to get the chip to pop out. Avoid the urge to try to flick the chip up with the gouge. For mouldings at the bottom edge of the rail, use a scratch stock in a pistol-shaped handle. The blade fits tightly into a saw kerf that runs down the barrel to the handle or fence. The blade's inner edge seats firmly against the end of the saw kerf and is locked in place by a bolt or screw immediately tangent to the blade's outer edge. For edge mouldings, run the saw kerf 6mm into the handle so that a matching projection on the blade can fit into it. The bottom edges of the barrel are chamfered so that shavings do not jam in front of the blade. Things go easier if you first bevel the rail's edge with a plane, then the scratch stock removes less stock to finish the moulding's profile. You can mark this profile on the end grain before you begin to see how much of a bevel to cut. Then scratch the moulding. Concentrate on keeping the handle tight against the edge of the rail. Rabbets, a special case of edge moulding, can be used to emphasise the bottom edges of rails. Make these with a rabbet plane. 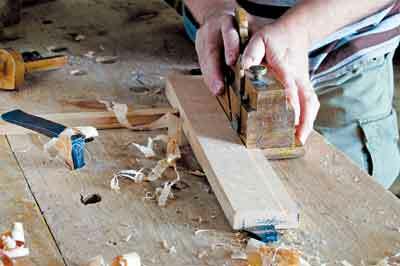 You can use a shoulder plane, essentially a metal-bodied variation on the rabbet plane. One nice thing about shoulder planes is that they usually have a low-angle blade, set with its bevel up. This slices the wood very cleanly. The downside is that they take a thinner shaving than we like. Thus, the wooden rabbet is still our tool of choice. If your rabbet plane has no fence, run it against a batten clamped to the stock. Make your rabbet about 12-20mm wide. You can eyeball the depth; it's just enough to throw a shadow on the rail. And don't make the rabbet so deep that it cuts into the face of the tenons. Rabbets are sometimes enhanced with gouge-cut decoration similar in technique to that described above. Others can use a zig-zag motif cut with a chisel, often then treated with a two-colour paint scheme. 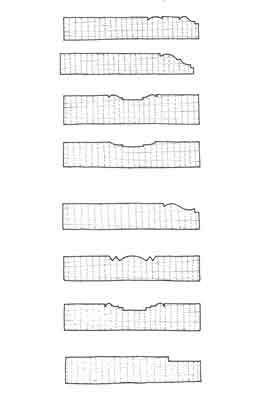 Some period moulding profiles have a central flat section - a fascia - flanked by beads, ogees or other shapes. We make these mouldings with a combination of a plough plane and a scratch stock. The plough plane is a grooving plane with an adjustable fence. It has interchangeable irons, often in sets of eight. 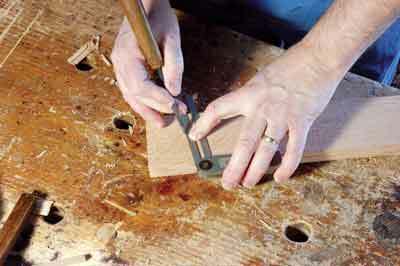 First, set the plough plane to cut a flat groove about 12mm wide down the centre of the rail's width. Now, using a scratch stock that will reach into the area just ploughed, scratch a small moulding that runs right against the edges of the ploughed groove. If you made a scratch stock that has the full-width profile, you can make this moulding with one setting of the tool; if you have just made the detailed shape that flanks the groove, then you need to scrape one side, then adjust the scratch stock and scrape the other side. 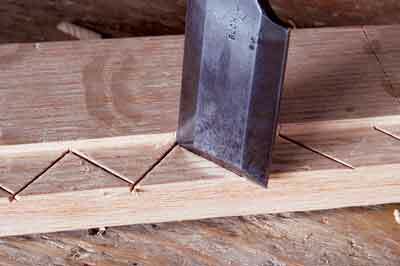 The sawtooth, or zig-zag motif is a simple one to cut. 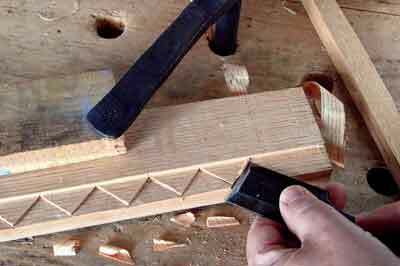 Once you have planed the rabbet in the bottom edge of your rail stock, use the awl and mitre square to mark the alternating lines to form the pattern. Then holding a wide chisel perpendicular to the rail, chop down heavily into the stock. It's best to chop all the marks that aim one way, then turn the chisel around and come back to chop the other half. This method helps you be more consistent and it's easier on your body. 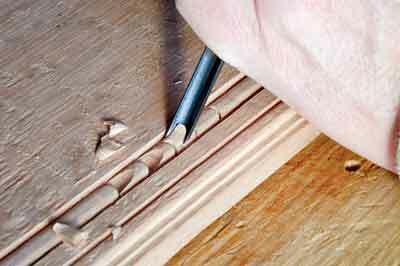 Now, using the chisel with hand pressure, hold it with the bevel up and pare toward the incised lines you just cut. It sometimes takes a couple of passes to reach the full depth. Again, do all the cuts heading one way, then turn around and do the others. This excerpt is taken from Make a Joint Stool from a Tree: An Introduction To 17th-Century Joinery by Jennie Alexander and Peter Follansbee. To purchase a copy for yourself, see details below.